Are you wondering how much Exilis Cost in Orange County? Aura Way of Life Spa offers high quality treatments as well as competitive pricing. Pricing will depend on a client’s desired outcome and the number of treatment areas. Typically, clients will require 2-4 sessions spaced two weeks apart to get optimal results. Exilis treatment of the buttocks and thighs. Although you may see immediate results after your treatment session, you will continue to see improved results over the next few months following your last procedure. Exilis offers three main benefits, fat reduction, skin tightening and rejuvenation. Fat Reduction. Exilis is an ideal treatment for areas of unwanted and stubborn fat. Treatments can be targeted to specific regions of the body, giving excellent results. Skin tightening. Exilis can help tighten aging skin by heating the collagen in the skin. This process causes the deep collagen structures of your skin to tighten immediately so you’ll see firmer skin right after treatment. The heat energy also stimulates future collagen production, so your skin will continue to tighten, giving you a more youthful appearance. Rejuvenation. By tightening skin and stimulating collagen, Exilis softens wrinkles and fine lines. This treatment can reduce jowls and redefine the jaw line. 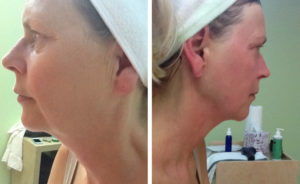 It can also tighten and smooth the neck and reduce excess skin under the chin. Many patients use it as an effective, non-surgical alternative to a face lift. Over time, everyone will experience the inevitable signs of aging such as wrinkles, fine lines and sagging skin. Maintaining a youthful and vibrant appearance is important, but many people cannot afford the downtime associated with traditional plastic surgery. Exilis is a new, FDA approved, non-surgical, non-invasive treatment for excess fat, wrinkles and sagging skin. Exilis is a non-invasive, non-surgical device that uses radio frequency (RF) waves to heat tissue below the surface of the skin. The procedure uses safe radio waves to heat your skin and targeted fat cells. This speeds up the metabolic activity of the fat cells causing them to shrink. At the same time, it stimulates and strengthens the collagen network, improving skin laxity and texture. Exilis is extremely safe and has almost no side effects. The most frequent areas treated with Exilis Therapy in men are the “love handles”, breasts, abdomen, face, jowls and neckline. In women they include: face, jowls, neck, décolletage, arms, “bra fat”, thighs, hips, breast, buttocks, stomach, and knees. Exilis is recommended for any patient who would like cosmetic improvement for unwanted fat, cellulite, wrinkling and sagging skin. This treatment offers cosmetic improvement without surgery. Since Exilis is not a laser, there is no skin peeling, pigment change or prolonged healing associated with its use. Visit Aura Way of Life Spa in Newport Beach, CA for the best Exilis Cost in Orange County. With ten years’ experience in helping people have beautiful skin, we are determined to give you the best treatment and experience possible.